Siteimprove Academy is a comprehensive e-learning hub for courses about accessibility, analytics, SEO, and more. Based on the Siteimprove team’s expert knowledge and more than 15 years of experience in the field, Siteimprove Academy’s free courses are your greatest ally for creating an inclusive and optimized digital experience for every site visitor. Assign courses and tracks to individual users; track progress. Keep up-to-date with your team’s overall progress, or check in on a course-by-course basis. Assign courses and tracks to individual users, teams, or sub-teams; track progress. Siteimprove will deliver on-demand customized, deeper, and scheduled reporting on your team’s Siteimprove Academy activity. Siteimprove Academy courses can be delivered to your organization for hosting in your own Learning Management System. Currently, Siteimprove Academy courses are only available in English. How do I get more information on the individual courses and what’s included? We have a course guide! Check it out to find out what you’ll be learning in each course. Can I get a sneak peek of the courses to see if they are what I’m looking for? Of course! You can get a sneak peek of our Siteimprove Academy courses on the Siteimprove Academy YouTube Page. If you have any questions about setting up your free course, email academy@siteimprove.com and we can help. The courses include quizzes, interactive content, and videos that offer an engaging learning experience. How many times can I access the courses? 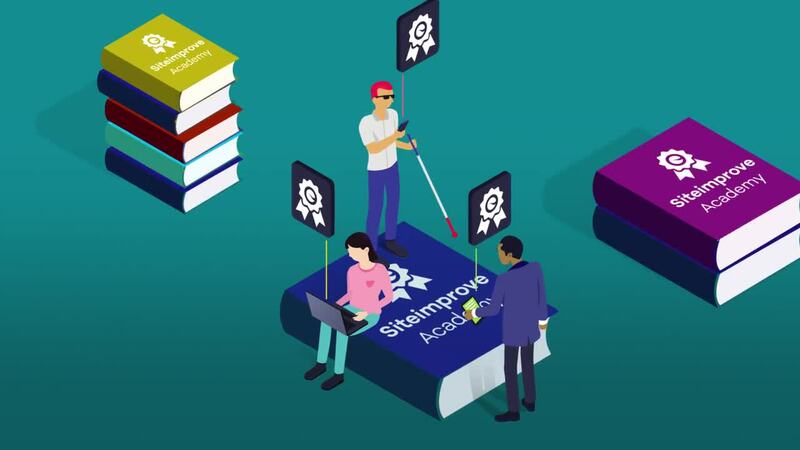 The free Siteimprove Academy offering gives you access to courses as many times as you want within the timed access period. Each course is estimated to take a half to full hour, but it depends on each learner’s individual pace. It’s also good to know that the Siteimprove Academy interface tracks your progress, so it’s easy to do them little by little or whenever you have the time. Do I receive a certificate for completing the course? Yes! You get a certificate for completing each course. Additionally, if you complete all the accessibility courses within a Learning Track, you get a certificate that recognizes this feat. My company has a subscription to the Siteimprove Intelligence Platform. Are the courses included in the subscription? Yes! All organizations with Siteimprove Intelligence Platform subscriptions have unlimited access to Siteimprove Academy courses and gain additional reporting and administrator capabilities. Simply log in to the Siteimprove Intelligence Platform and select the Help Center and Academy button at the top of the page to get started. Talk to your Customer Success Manager if you want more information! Become an accessibility champion this year! Get up to speed with all the latest Academy updates in this on-demand webinar. "The addition of Siteimprove Academy has enabled us to conduct end-user training that before would have to take place in group settings without the ability to self-pace." "I really appreciate how the courses use videos to increase awareness of the types of accessibility issues people face. The courses educate on the history of making websites accessible and easily made the case for our need to step up and create web design that can be accessed by everyone who uses our product or service. I especially liked the design and final assessment." Ready to Get Started? Choose the best tier for you and sign up to become an accessibility champion!